Yoga is very much about the relationship you have with the teacher. This is the reason that when David travels and does an ashtanga yoga Mysore workshop the number of students in the room at one time is limited to a maximum number of 12. The second part is that you have to commit to signing up for all 5 days. With my commitment to small numbers and your commitment to daily practice, a transformative and in-depth relationship can be created. After teaching anatomy and yoga for nearly twenty years, the core of movement in practice can be brought back to three anatomical points that direct you toward the core of the body. 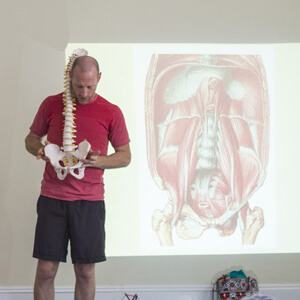 This workshop is about simplifying the complexity of where to practice from anatomically. 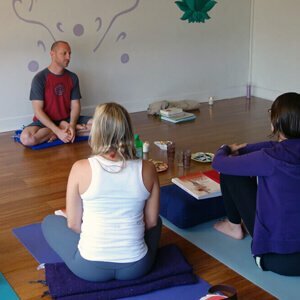 In this workshop, David will take you on a journey through the anatomy of your breath. From the diaphragm to the abdomen, and pelvic floor. It’s not as simple or limited as inhale and exhale, oh no. In the anatomy for ashtanga workshop, we will work with and talk about those pieces of anatomy that feed the doing of your practice correctly. What is correctly can certainly be debated. What would Guruji mean by correctly? I think it would be the core of the practice, which is breath, bandha, and dristhi (tristana) all of which are performed while doing asana. Everyone has postures that challenge them. Many students have difficulties in certain sections of practice, particularly with postures such as marichyasana D, supta kurmasana, lotus, and backbending. This workshop focuses on breaking down these difficult postures. The ashtanga vinyasa count workshop is about understanding how to use the count as a mechanism for bringing focus and clarity to the practice. Like a mantra, it protects the mind from distraction during the practice. The bandhas are the most elusive aspect of practice. They’re subtle components of the not very well understood energetic body. What if there were a physical part of them that you could access? What if you knew what these were? Bandha understanding comes theoretically, energetically and physically. Looking at the mysterious bandhas from different points of view will absolutely help you to employ them in your practice. If you can access them, your practice will come from the inside out and be more energetic in nature. The traditional purpose of the led class is to direct a large number of students through a series that they are familiar with. Ashtanga has an ideal number of inhalations and exhalations done in certain places with associated movements. The led class offers an opportunity to clarify where and how those breaths should and should not be. This course is appropriate for practitioners and teachers seeking to deepen their own Ashtanga Yoga practice as well as for those who are already sharing and teaching the Ashtanga Vinyasa system. Having said that, this is not a complete teacher training. One needs to practice for many years in order to teach. This workshop should be seen as an in-depth look into this particular system.